A photo of Gerald Andrejcak pictured with a snake he has cared for. Photo courtesy of Gerald Andrejcak. 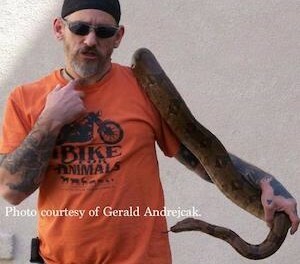 SUSSEX COUNTY, NJ – “The last thing I wanted was any form of publicity,” said Gerald Andrejcak, the assistant manager of Common Sense for Animals, who had previously dedicated his time since approximately June 14 to searching for a large snake on the loose in Lake Hopatcong, which he has said is an anaconda. What started out as an effort to help, Andrejcak said, has since turned into a media frenzy for Andrejcak, who told NJ Inside Scene that he has become the scapegoat for the hype that has developed over the snake. “The media turned me into a pariah because I didn’t want to sensationalize it,” said Andrejcak. 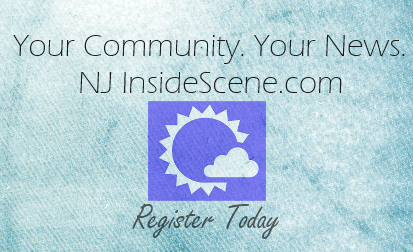 NJInsideScene.com first reported on the story on July 20 (click here for our story). 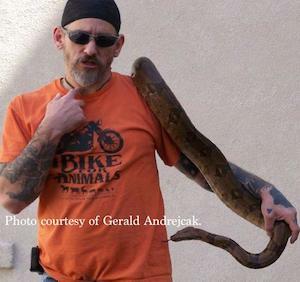 He said he has been misquoted, and blamed for circumstances surrounding the snake headache that has evolved when the local authorities began receiving calls beginning on June 9 from citizens about the estimated 15-foot long reptile swimming in the lake. “The whole thing has been screwy from the start,” Andrejcak said. He has since announced yesterday he has disconnected himself from the search after receiving a blocked call instructing him to “walk away” from the pursuit of the snake. Dale Sloat, Hopatcong Borough’s Animal Control Officer was the one who reached out to Andrejcak for help. “I was skeptical,” Andrejcak said at first about the snake’s potential presence. By the time Andrejcak became involved there had already been many reports called in by residents and boaters about the creature that many had classified as a boa constrictor. Andrejcak felt the reptile, which he nicknamed “Henry,” bump against his one leg, then bounce off of the other one from under the water. He conferred with other parties involved with the search, he said, and he told them he was sure the snake was not a boa, but an anaconda. He was then told he should be “sworn to secrecy,” because of the panic the idea of an anaconda would create, and continue to tell the public that the snake was a boa. The following day, Andrejcak, who said a reporter had overhead the conversation, was told that particular reporter was walking around the residence adjacent to the lake where the snake was last spotted, with a biologist. Andrejcak said following the arrival of the biologist, the press began writing about the snake’s classification as an anaconda, and that the identification of the snake was attributed to him. Yet, Andrejcak, who had been sworn to keep his lips sealed about it, he said, did not leak the details about the snake species to the press. Following the reports, he came forward to state he was told to keep things quiet, to set the record straight about how the information was disseminated. He told NJ Inside Scene he has suffered from the backlash, and his knowledge and reputation have both been wrongly questioned. Andrejcak has been working with animals for many years, and specifically now through Common Sense for Animals, a non-profit organization based out of Warren County. “It was probably a ‘dump job,’” Andrejcak said of the reptile’s presence in Lake Hopatcong. He said the organization he works with often receives calls of many types of abandoned animals, from dogs and cats, to snakes, to everything in between. “A boa doesn’t become a stray,” he said. He said these exotic snakes are often dumped because owners no longer wish, or are able, to care for them. His agency, he said, has received calls, including as an example, of a large boa constrictor sunning itself in a roadway to warm its body up. A motorist nearly ran the reptile over. In addition to animal rescues, Common Sense for Animals, after the seven-day waiting period is over for a pet’s owner to show up, adopts out its rescues. New Jersey’s State Department of Environmental Protection (DEP) has since classified the idea of the snake in Lake Hopatcong as a “hoax,” and has denounced Andrejcak as having “no credibility,” Andrejcak said. He added that parties have still called in with sightings of the snake, and the DEP’s response has been that those who have made all the calls are also not considered reliable. “You can’t tell me it’s not out there, I know it’s out there,” said Andrejcak. The night before the DEP made its statement, a boat, which he said showed up several times during the search efforts including the night that Andrejcak first showed to the lake, also made an appearance near the home of the resident where the snake was spotted. During the times the boat showed up, Andrejcak said it remained on site for five hours at a clip, before disappearing. 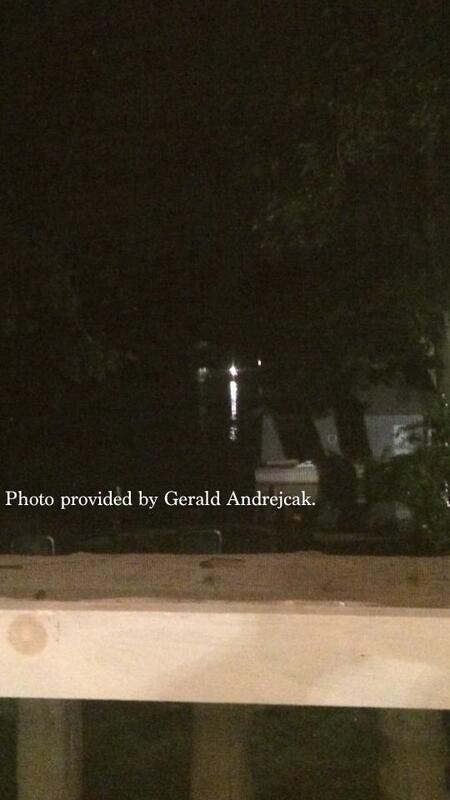 Andrejcak has supplied a photo of the boat to NJ Inside Scene. Gerald Andrejcak supplied this photo to NJ Inside Scene of a boat that he said, spent time around the site where the snake was spotted for lengths of time on several occasions, and was last spotted the evening before the DEP called the snake in the lake a “hoax.” Photo courtesy of Gerald Andrejcak. The elusive snake has since gained a following, with t-shirts sold with “Snake in the Lake,” “Snake on the Lake,” and “Summer of the Snake,” emblazoned on the front. Some local Dunkin Donuts shops, such as the Route 15 location in Jefferson, have gotten into act with the limited edition “Snake Hopatcong” variety of doughnuts, glazed with blue icing and each topped off with a sugar-coated gummy worm candy. The doughnuts have been reportedly selling out from locations where they are sold. Additionally, social media sites have emerged, including a Twitter Page with “Hopatcong Anaconda,” as the moniker and “Snake Hopatcong” on Facebook. The fan count quickly rose to more than 3,200 since its inception five days ago on Facebook. 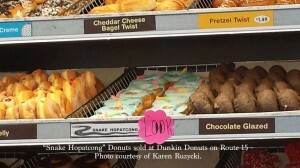 “Snake Hopatcong” Donuts for sale in Jefferson at Dunkin Donuts. Photo courtesy of Karen Ruzycki. Andrejcak said that he initially found the “Snake Hopatcong” page humorous, until the parties behind its operation began slandering people, he said. He became one of the targets. “’Your identity is going to come out at some point because you’re bashing people,’” Andrecjak said he wrote. He said a smear campaign has ensued against him, between the media reports, the DEP, and social media. “Humanity has shown its ugly head,” Andrejcak added. Andrejcak told NJ Inside Scene that he is leery to offer further advice about the situation anymore since the media melee spun out of control, when his original intention was to only help, but notes in follow up that “someone or something could get hurt” if the creature resurfaces and is approached. Since his time in Lake Hopatcong, Andrejcak has been battling a bacterial infection on his feet, caused from the dampness in his boots after his feet had been submerged for hours on end in the lake, and has required medical care. He said the time spent has also taken precious time away normally with family, including his granddaughter.